Bli Bli Castle is one of the most unique events venues in all of Australia. It is our one and only medieval style castle, complete with draw bridge and moat, dungeons and of course, sky-high turrets. These great looming halls play host to any number of fantastic events, but by far one of the best has to be its bi-annual opera performances. There’s nothing quite like listening to a haunting operatic movement sitting within the dark and cold walls of a stone dungeon. The powerful voices seem to grow stronger and more powerful as they bounce off the walls that feel as though they may have played witness to any number of dark horrors. It creates an almost unworldly chill down your spine to be a part of such a spectacle. It’s not all gothic doom and gloom; the performances contain a number of different movements and chapters to tell amazing and fantastical stories of drama and excitement. The performance on its own is moving, but with the added benefit of such an immersive environment, it is something to behold. 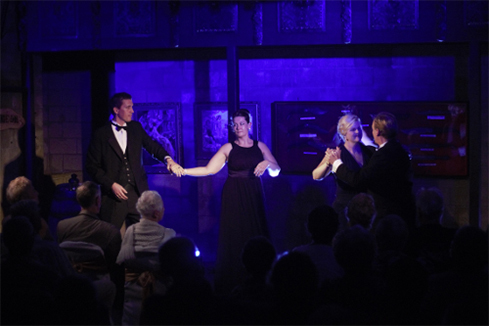 The Underground Opera Company have been performing around Australia for years and have garnered a reputation as one of Australia’s foremost operatic organisations. They are a professional company that produces concerts of ‘world-class standard in underground spaces’, usually caves and mines and other industrial environments creating unique and bewildering experiences, making a castle dungeon a more than comfortable venue for them. The seemingly maniacal genius of an idea for a performing arts company was founded by Bruce Edwards. “A miner of 20 years, Bruce founded the Underground Opera Company seven years ago with the view to making opera fun and accessible. Bruce proudly provides platforms for Australia’s most talented performers to entertain audiences from all walks of life and is responsible for creating over 40 extraordinary performances in breathtaking spaces” according to their homepage. In my humble opinion Bruce has done an amazing job, and along with his troop of performers continues to provide engaging and beautiful entertainment for any game enough to walk the hallowed halls. Tickets are limited to just one hundred seats and if the last four years have been any indication, tickets will be selling quickly. The performance is more than worth the ticket price of $70.80, including complimentary canapés in the courtyard during intermission. This production makes for a wonderful experience and sets a new standard for intimate performance excellence and I would highly recommend it for any great classical music lover, or anyone just looking for an entirely different and unique musical experience, opening on the 24th, until the 26th of October. Checkout their Facebook page here and their website here.